A few weeks ago, I published Part I of this column and there were quite a few opinions blasted at me due to its controversial nature. So, here’s Part II. As a believer, how do you navigate the waters of a prenup society? 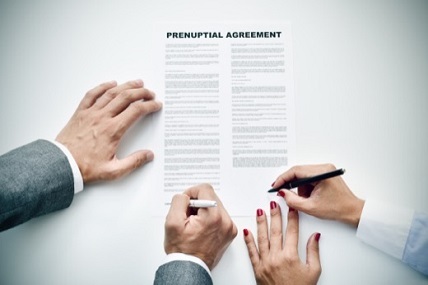 Here are 7 factors to consider if your romantic partner asks you for a prenup or you yourself are mulling it over. 1) Not everyone who asks for a prenup is selfish, thinks they will get a divorce or wants to shut you out financially. People have seen a lot, they may have seen other people suffer or they may have gotten advice from places they probably shouldn’t. So don’t instantly demonize someone for bringing up the possibility of a prenup in your marriage. Have an honest and transparent conversation. Really discuss the concerns on both sides and prayerfully do what will set you up for a successful marriage. 2) Unless the circumstances are extreme and unique, my suggestion is NOT to get one. I have a feeling that getting a prenup is like a person who says they never want intruders to break into their home. So they will build a shed right next to their home and make that shed really beautiful so that if intruders and thieves ever pass by, they will pick that shed and not their home. Well, that will be true at first. But the reality is that the presence of that pretty shed increases the possibility of thieves robbing the shed and therefore it increases the likelihood that the home will be robbed sooner or later. 3) The general divorce rate may be 50% but finding after finding confirms that the divorce rate for practicing Christians (and people of deep faith, in general) is significantly lower. So don’t be caught up in the fear. Don’t let the media tell you as a believer that working with God in selecting and living with a spouse still leaves you at a 50/50 chance your marriage will implode. It is not true. 4) Marriage takes work and no matter how many legal documents you sign that seek to guarantee you certain dollars and certain behaviors, your marriage will crumble if you are not willing to put in the work and be 100% committed. 5) God knew what he was doing when he instituted Marriage. *Marriage is meant to reflect our relationship with him. *Marriage is meant to reduce the self for the sake of the unit, not protect the self against the unit. 7) From what I have gathered on prenups, they (especially financial ones) imply that the couple is saying “once we separate our most cherished resources, we can get back to loving each other completely.” I don’t think that holds true. I think the Bible is on to something when it says, “for where your treasure is, there your heart will be also” - Matt 6:21. It goes further to say in verse 25 that “You cannot serve God and Mammon,” meaning “even God can’t compete with your attachment to your money and your physical assets. If God loses when you are attached to those things, I think it’s easy to say that your human spouse will lose too. Phew! That was a lot. Hope this helped! Tobi Atte is a certified Neuro Linguistic Programming Practitioner, motivational speaker and the writer behind IJustMetMe, a lifestyle website for young adults who need a good dose of daily inspiration to tackle tough life issues. Tobi is also the creator of the new online marriage course Ready for Forever, the author of the book How to Make Sure Your Values are Aligned: A Guide to Avoiding Relationship Frustration. For more on relationships, motivation, fresh perspectives on faith, personal improvement and more, read/learn more at www.ijustmetme.com, watch him on YouTube HERE and download his free e-book HERE.